by New Holland Publishers (UK) Ltd. Enter the wonderfully whacky world of Donald Trump and within the pages of this book seek words of wisdom from the man of himself. Donald J. Trump is a force of nature ...and that's only his hair! The self-made billionaire, reality TV star, GOP candidate and US presidential hopeful, Trump is a veritable walking, talking, media magnet. Always quotable during his now decades long career, Trump hit new heights when he announced that he was running for president as a GOP candidate in 2015. Since then it's been a daily barrage of quotes, brinkmanship and one-upmanship ...all of it detailed in this new book. 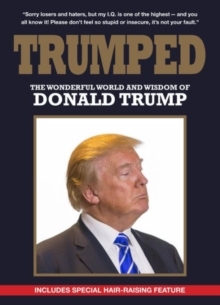 Trumped: The Wonderful World and Wisdom of Donald Trump is a record for the ages. Every quotable quote from one of the most quotable men on the planet. Regardless of Trump's fate as a presidential candidate -when we can all fondly look back and ask, 'What just happened?!'. Call him 'Trump', 'Droompf' or 'F**ckface Von Clownstick', there is only one Donald J.
Trump. INCLUDES SPECIAL HAIR- RAISING FLICK FEATURE It's freezing and snowing in New York- we need global warming! Twitter, 7 November 2012. My fingers are long and beautiful, as, it has been well documented, are various other parts of my body. New York Post, 2011 It's like in golf. A lot of people-I don't want this to sound trivial-but a lot of people are switching to these really long putters, very unattractive. It's weird. You see these great players with these really long putters, because they can't sink three-footers anymore. And, I hate it. I am a traditionalist. I have so many fabulous friends who happen to be gay, but I am a traditionalist.